Effective mathematics specialists require opportunities to apply knowledge from their advanced preparation programs to their practice. Just as pre-service teachers engage in field experiences to practice instructional strategies, in-service educators should engage in field experiences to apply leadership knowledge and skills while under the supervision of an experienced and highly-qualified teacher educator. 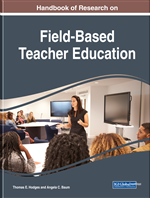 This chapter describes the culminating self-study field experiences in a masters-level advanced certification program which prepares in-service teachers to be K-8 mathematics specialists. Through collaboration with critical friends, the mathematics specialist candidates connected research to practice in the design and implementation of a self-study project. Their work chronicled an important transformation from teachers to teacher leaders. The candidates also described their interest and their new capacity to conduct research beyond their certification programs for the purposes of impacting teacher and student learning within their organizations. Teaching mathematics requires specialized pedagogical content knowledge (Ball, Hill, & Bass, 2005; Ball, Thames, & Phelps, 2008), yet many elementary educators are generalists (Wu, 2009). As a result, individuals are entering the teaching profession with the need to further develop the specialized pedagogical content knowledge required for mathematics in order to possess strong understanding of mathematics content at all levels (Spangler & Ovrick, 2017). Mathematics specialists, at times referred to as mathematics coaches, are a viable solution to improving practicing teachers’ mathematics instruction (Campbell & Malkus, 2011). Across the nation, there is little agreement regarding both the titles (McGatha & Rigelman, 2017) and roles (Fennell, 2017) of mathematics specialists. McGatha and Rigelman (2017) define a mathematics specialist as “a professional with an advanced certification as a mathematics instructional leader or who works in such a leadership role” (p. xiv). In their definition, McGatha and Rigelman describe three primary roles that a mathematics specialist might take on: 1) a mathematics teacher who is situated in a K-12 classroom; 2) a mathematics intervention specialist whose work centers on K-12 “push in” or “pull out” intervention programs and students, and; 3) a mathematics coach that works primarily with teachers. No matter how situated, a mathematics specialist synthesizes content, pedagogical, and leadership knowledge to connect research to practice in schools. According to the 2011 National Assessment of Educational Progress (NAEP) survey, 3,010 out of 7,940 elementary schools (38%) reported the use of either a full- or part-time elementary mathematics specialist (Harbour, 2015). Currently, 20 states have either a state certification or endorsement pathway to become a mathematics specialist (Rigelman & Wray, 2017; Fennell, 2017; Spangler & Ovrick, 2017). These advanced certificate programs prepare practicing teachers to further develop expertise in mathematics content, pedagogy, and leadership (Association of Mathematics Teacher Educators [AMTE], 2013) and mathematics specialists to flexibly work with any student or teacher at any level (Spangler & Ovrick, 2017). “An interest in leadership does not necessarily indicate strong content knowledge on the part of participants” (Whitenack & Ellington, 2013). Specialized leadership coursework is required to provide specific experiences not found in content and pedagogy courses such as: developing and implementing high-quality professional development; providing constructive feedback; understanding how teachers’ beliefs are sustained and changed; and advocating for high-quality mathematics instruction for all (Spangler & Ovrick, 2017).